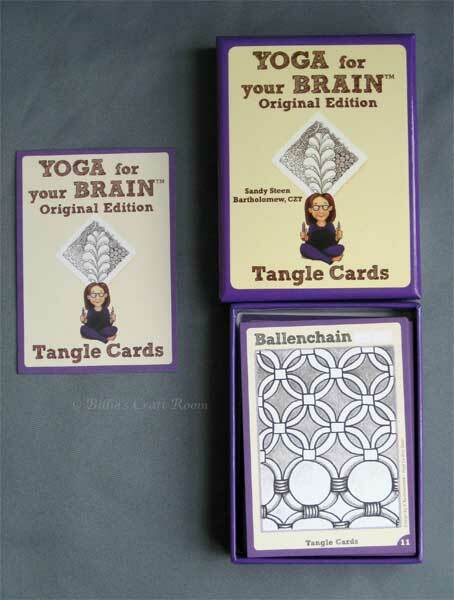 Today a review of; Yoga for the Brain Zentangle cards original Edition. 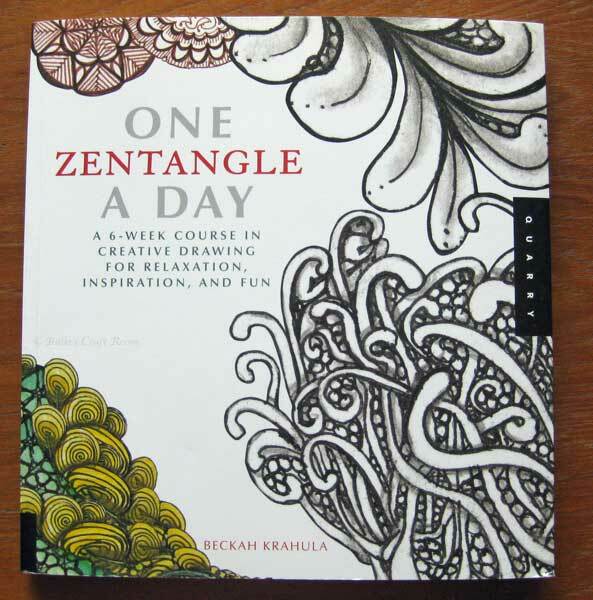 I liked the relaxation mentioned about Zentangle but the book I had just wasn’t fun, nor inspiring. I’d seen these cards on TV so thought I’d try them instead. If you want to learn to Zentangle but don’t have a lot of time and space, these cards might be for you. Here is how I got on with them. The box is superb, sturdy card and glossy. It would last well if you were carrying it around with your or giving it to younger members of the family for them to try Zentangle. The cards are also printed on a sturdy cardstock, I’d have liked rounded corners to be kinder on hands but that’s being picky. As has been mentioned in reviews on Amazon the cards are not laminated or glazed. This reduces eye strain but given they are a deck of cards, they don’t easily slide over each other like decks of cards usually do. Making them a little tricky to get hold of, but my dexterity isn’t great. Good. You get 40 designs to copy around the same as in books, there is a book of the same title but I haven’t seen it to say if the content is the same or different. There are about 9 cards at the front with some tips for basic steps for how to Zentangle but nothing too heavy that would put you off. Yes, I really like the card deck layout for patterns and would favour collecting designs this way rather than a book. These really worked for me. They are catchy, addictive, portable and the sort of size you could have next to you as you copied the design. I liked them a lot. After my experience with another Zentangle book, I had thought it wasn’t for me, yes the creation of the patterns was very relaxing but I wasn’t in love with any of the designs in the OTHER book and it put me off a bit. The patterns in this deck I liked, which got me hooked and I can see why people get so excited about it. It IS very relaxing and meditative to create the patterns. If you don’t enjoy the whole ‘card has to be x size, draw dots in each corner, doodle a line then fill in with a different pattern in each section’ rules n regulations that Zentangle has around it, then these cards liberate you from that. Life’s too short for too many rules, just grab a notebook and copy the patterns on these cards, in a comfy chair with some relaxing music on and you will be a chilled happy bunny in no time. Its engaging enough to stop your mind being distracted by stress and worry and repetitive enough that you quickly get in to the swing of the pattern and just draw. Several of these designs would make great boarders or for bookmarks not just all over page designs. I highly recommend these cards, even and especially if other Zentangle products haven’t done it for you. Great for long car journeys or while waiting in a waiting room etc or on holiday when you don’t want to be carrying too much stuff but want to create. The only other thing you need is a 0.1 micron pen and some decent paper, but if you haven’t got that a decent fine-liner and a notebook and you are away. For younger kids I’d use a regular pen as the 0.1 pen is so fine they are likely to snap it off with too much hand pressure. If you get into it, add a soft lead pencil and paper stump to add more dimension to your designs with shading. Yoga for your Brain Amazon UK great price as ever. 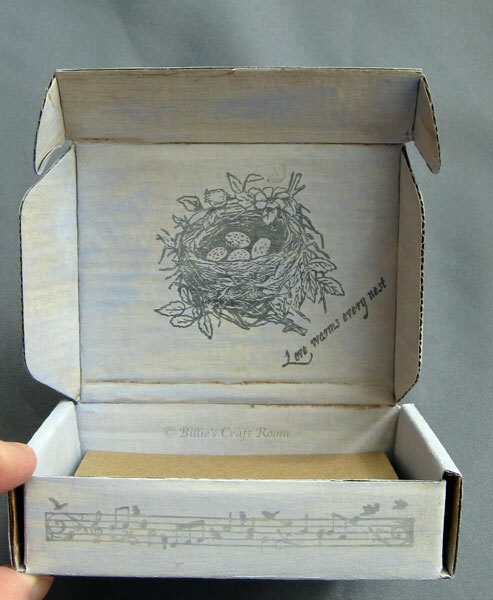 Today I’d like to share an altered box art project. DH was going to put this in the bin when it was a plain cardboard box. 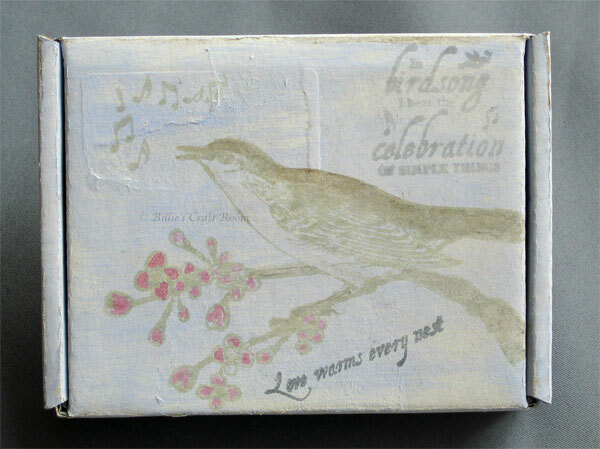 I rescued it and altered it using The Birdsong Collection of stamps from Clear Impressions that were on Creative Stamping magazine. 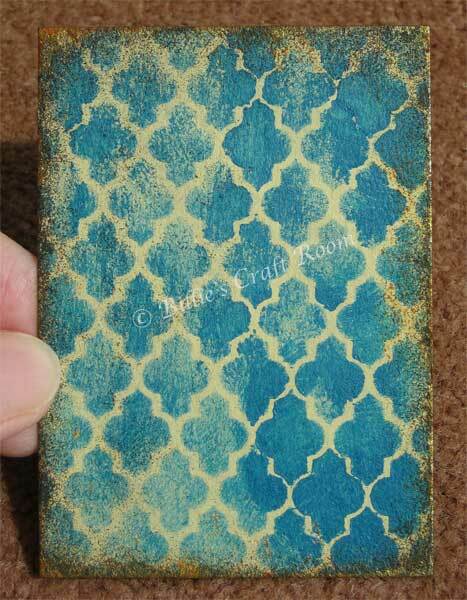 To tone down the stamping and help it fade into the background I went over it with watered down gesso. 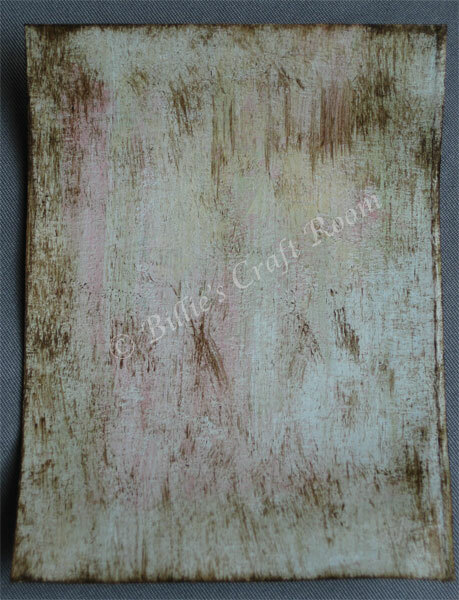 Hope you like it as much as I do, it looks very pretty on the desk, waiting to be filled with inspirational quotes or ATCs. For the first time in ages I made a card. 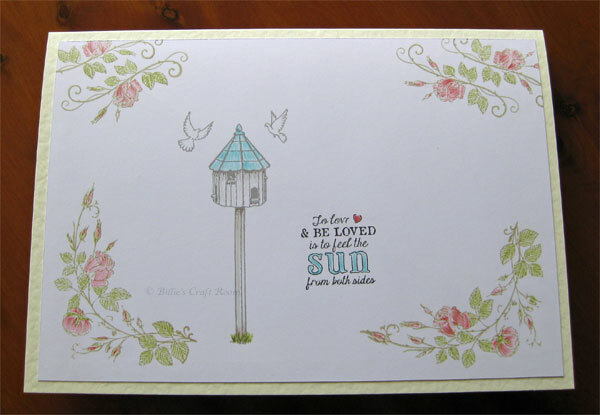 The stamps were from Creative Stamping Magazine the Garden Collection. Sometimes you don’t want to go overboard, just get back to basics. It woke up my love of stamping after a year of doing so little of it. The stamps are lovely and can be combined in so many different ways. Here is a picture of a recent Zentangle I drew. One Zentangle a Day book. Not getting along overly well with it, there are a lot of tangles in it and it has more wording than I’ve seen on previews of other Zentanlge books on Amazon preview, but I’m not sure how and when to turn the card, so kinda winging it. I also get the feeling that the style show in the way it is in the book puts pressure on and leads you to over think things a bit. I have really enjoyed Tiffany’s tutorials on Zentangle on You Tube as you see the tangle created and are then able to use the design show in a more freestyle way. Have to say I’m on the fence about Zentangle, the relaxation part works but as yet haven’t created something that I ‘love’ at the other end. Maybe because I’m still learning. 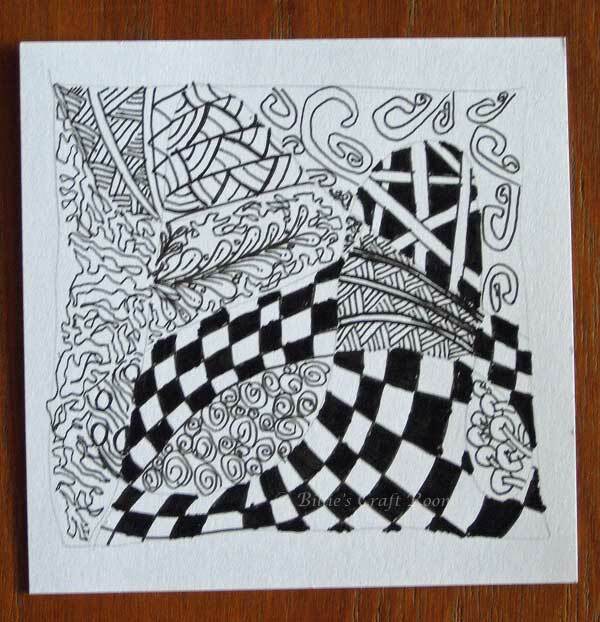 There seem to be a lot of ‘rules’ about Zentangle which to me flies in the face of it being a calming thing. But hey, I guess The Tea ceremony and calligraphy are also zen like activites and they too have a set way of doing things, so maybe it isn’t so strange. Do you tangle? Would love to see what you have drawn, there seems to be a wide range of ways people use this art form. If you have found any great tutorial sites do let me know and I’ll try and add them to the Art tab at the top of the blog. Do you have a Filofax? Like to design and make your own pages? 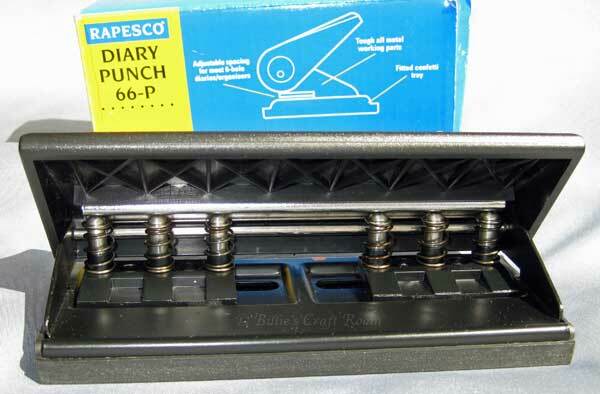 In today’s post I will be reviewing; Rapesco Diary Punch 66-P its just what you need for many sizes of Filofax organizer. I invested in a number of organizers over the years, in different sizes but I wanted to make my own pages so needed a punch. This one was great as it will let you punch different spaced holes for more than one size of binder. Adjustable spacing for the 6 holes. They are set in two groups of three holes. Respect the number of pages it wants to cut and it will last for years. Don’t force it to do more than its designed for. Punches holes for Pocket, and Personal size Filofax organisers. With a little practice will punch A5 Filofax pages too. Excellent. Metal body and has lasted very well I’ve had mine over 14 years and although its had light use it still works fine. Superb, the fact one punch will work for multiple sizes of page is brilliant. 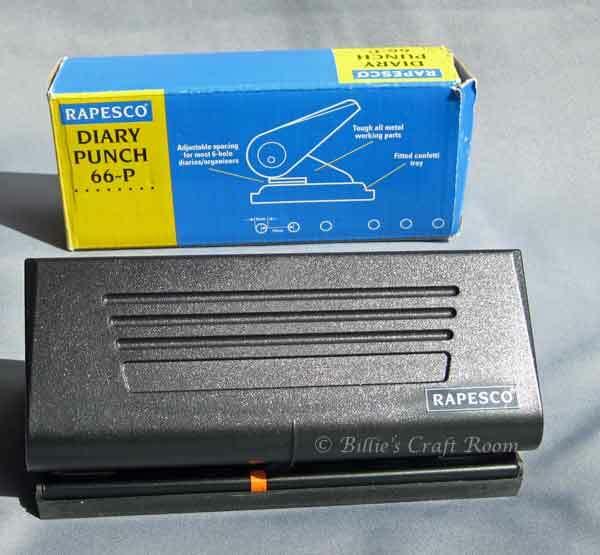 This punch has done everything asked of it, you can punch several 80gsm weight papers at a time and I’ve also punched 220gsm card with it. It happily punches holes for Pocket sized Filofaxes and by widening the gap between the sets of three holes you can also punch for Personal size pages. With a little experimentation you can also use if for A5 Filofax pages, by tracing though your pre punched page and making a card template. 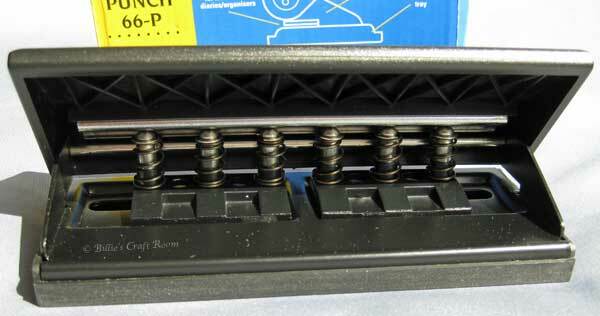 You need to punch three holes at a time only for the A5 then turn you page over to do the other three but its possible, making it even more versatile. Because its punching 6 holes you could NOT use it for MINI size Filofax as they have only 5 holes. If you would like to see a video demonstration of this product for the A5 page leave me a comment and I’ll see what I can do. Any questions just leave me a comment. Instead a close up of the ATC project I was working on at the time I took these pictures, check out my ‘new to me’ paint colours, pastel! Yes I’m still in shock too, they are very nice but I’m still getting used to what to do with them and what colours they will play nicely with. 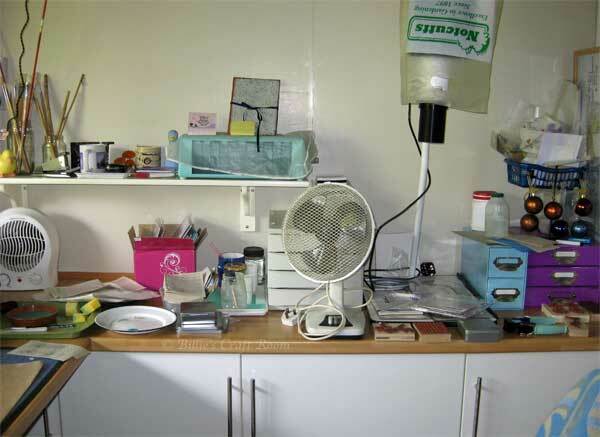 Hope you have enjoyed a look round my studio, maybe I’ll post some more pics soon of after the tidy up 😉 Holler if you want to see the ‘after’ pictures hehe. Where do you create? 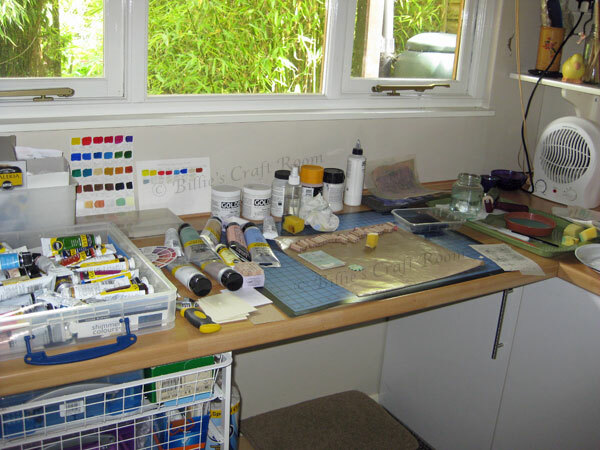 Love a nosey round studios online, go on show us your studio pics and maybe we can have our own little blog hop, post your craft room pics in a blog post and link up in your comments below. Mixed media mash up, Acrylic paintings go digital. What happens when you take two acrylic paintings and merge them? 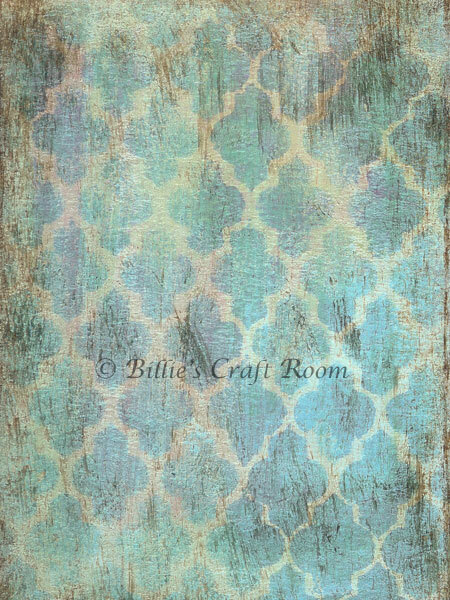 Today I’m sharing a picture which is a digital blend of two of my recent mixed media backgrounds. 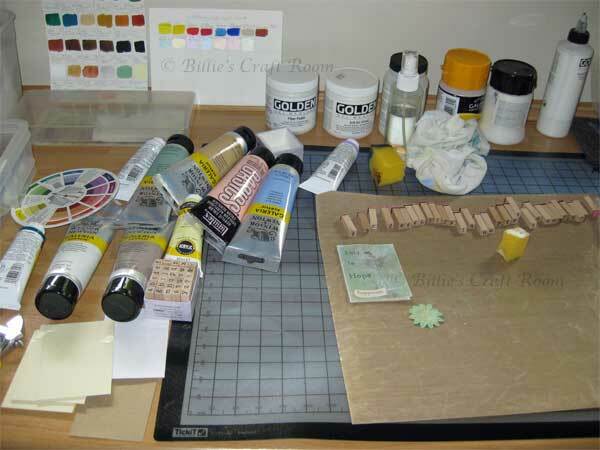 Mixed media background with stencilling. These were two of my favourite background paintings so I scanned them into the computer and then took them into Photoshop Elements and played with the opacity and this was the result. Play a bit more and you could add a photo in there somewhere too.